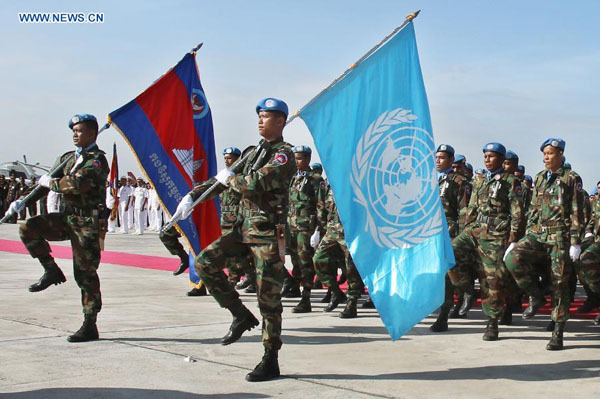 Cambodian soldiers on their way to Lebanon to “keep the peace” for the UN, Dec. 2012. They are actually human shields for Hizballah terrorists. A draft resolution circulated by the United States, Israel’s closest ally, and obtained Wednesday by The Associated Press calls for the re-establishment of full Palestinian Authority control over Gaza, which was ruled by Hamas militants who refuse to recognize the state of Israel. The Palestinian Authority does not have the ability to disarm Hamas or prevent Hamas from rearming. On the other hand, it is dominated by people who hate Hamas as much as they hate Israel, so introducing the PA into Gaza can’t be all bad. The Security Council is also considering “elements” for a resolution proposed by European nations, and a Jordanian draft resolution backed by the Palestinians and their supporters which was written before the latest cease-fire . The European proposal goes further than the Americans, calling for the establishment of an international Monitoring and Verification Mission in Gaza to ensure that the cease-fire agreement is implemented and to investigate reported violations. On the surface, it appears as though the UN is supporting Israel’s call for disarmament of Hamas. But as happened in Lebanon after the Second Lebanon War of 2006, a UN mission will be a disaster for Israel. No UN personnel will endanger themselves by trying to interdict Hamas military operations in any way, and their ‘investigations’ will not result in action. A UN mission will perform the same function for Hamas in Gaza that it does for Hizballah in Lebanon, which is to prevent Israel from taking action against Hamas. They will be human shields. Apparently Israel’s military planners thought they didn’t need to mortally wound Hamas because they believed that they could always come back and “mow the grass” every few years. They seem not to have learned from their experience in Lebanon, where Hizballah now has five times as many rockets as it had at the beginning of the Second Lebanon War, as well as significant qualitative improvement in its fighting ability. All this was obtained under UN protection. The UN, the European governments and the Obama Administration do not endorse Hamas terrorism. Most of them would agree that Hamas is a terrorist organization and should not be supported in any way. Most would even say they agree that Israel has a right to exist. But the policies that they propose belie their words. It is not possible to understand their policies — in connection with Hizballah, Hamas, the disputed territories, Iran, etc. — in any way other than as policies designed to strategically weaken Israel in the face of its more violent enemies. If Israel did not resist their demands, it would soon cease to exist in a violent bloodbath. Whatever else you may say about PM Netanyahu, he has no illusions about the attitudes toward Israel found in the European and American capitals. Whether they believe that an attenuated, weak and dependent Israel can and ought to survive, or that the ‘mistake’ of 1948 should be ‘corrected’ (they will deplore the violence inherent in the ‘correction’, of course), they clearly do not favor a strong, independent Jewish state. Israel might well lose the battles it won on the ground in the chambers of the UN. Again. This entry was posted in The UN, War. Bookmark the permalink. Israel should not cooperate with the U.N. in any of its investigations. It should rely on the U.S. veto to prevent any kind of disciplinary actions against it. Unfortunately no U.S. Administration has shown a proper attitude toward the U.N. and especially toward U.N. R. W.A. The U.S. should not be providing funds for an organization so corrupt, so invested in making worse the situation and problem it was created to properly care for. I of course do not expect this under the Obama Administration. The U.N. is little more than a terrorist organization itself these days. Their idea of aiding people is to send in troops that do nothing but head for the hills at the first sign of trouble; they generally end up needing to be rescued. The money that we waste supporting the Useless Nitwits could be put to better use by fully supporting Israel. The United States has few friends left worldwide: they see how we treat our friends and enable our enemies, and want no part of it. Obama is a disgrace, and so is everyone who does not support Israel’s right to exist. Israel needs to mow down the terrorists and ignore the Useless Nitwits. There will never be peace as long as Hamas, ISIS, the U.N. And other terrorist organizations are allowed to exist, and are supported by our tax dollars.